I’d never seen a road like it. And yes, I do realise every single one of my Namibia posts has had some kind of comment on the quality of the roads in them, but this one was seriously bad. After spending an incredible day at Vingerklip, part of me was wondering how we’d manage to better an experience so incredible. Ahead of us, we had time planned in the adventure sports town of Swakopmund, the sand dunes of Sossusvlei, and the ghost town of Kolmanskop, so I’d be lying if I said I didn’t have my hopes high. But better than Vingerklip? I wasn’t convinced. Up next was Swakopmund, and our day-long drive to get there would take us west across the country to the Skeleton Coast. It’s known for its adventure sports, which have rarely been a successful venture for me, but after reading that this German town often ended up being one of the highlights of travellers’ time in Namibia, Dave and I had dutifully planned three days there. We just had to make sure we arrived in one piece. Let’s just say it wasn’t a shock to learn they’d filmed Mad Max: Fury Road in the area around here. Imagine driving over that road for four hours in a small two-wheel drive, because that’s exactly what we did. It was slow going, and the clinks and clunks and rattling of the car had us with our podcasts at full volume and still only hearing half of what was said. I felt guilty that Dave was doing all of the driving in Namibia for the 50th time since landing in the country, but I also knew that if I’d taken over the wheel, we would already be dead. I wouldn’t have been surprised to discover the driver of this car gave up on life half-way to Swakopmund and threw a match at their vehicle. I knew battling our way through the sand would be worth it, though, because it was leading us to the eerie Skeleton Coast. When I first booked flights to Namibia, this had been the one thing that had been right at the top of my travel wishlist. This famed stretch of sand is littered with thousands of wrecks in various states of rusting, washed up thanks to Namibia’s treacherous combination of violent seas, strong winds, dense fogs, and challenging currents. Namibian Bushmen refer to the region as The Land God Made in Anger, while Portuguese sailors named it The Gates of Hell. Fun fact: last year, a 500-year-old shipwreck was discovered along the Skeleton Coast with 13 million dollars worth of gold coins on board, so obviously I was determined to find my own fortune as we road tripped our way along the Atlantic Ocean. Well, it turned out the Skeleton Coast wasn’t quite what I was picturing. For starters, the wrecks aren’t nearly as accessible as I’d imagined. You’ll need a 4×4 at a minimum to get to most of them, they’re fairly spread out, and many of them have either been dissolved by the salty air and winds or dismantled to be sold as scrap metal. All of the wrecks I’d hoped to visit had vanished in recent years. These days, one of the easiest one to check out is the Zeila, a fishing trawler that had been on its way to India when it ran aground back in 2008. It wasn’t quite what I had been hoping to see, which had been more along the lines of this, but it was pretty cool nonetheless. And hey, it gives me one more reason to return to Namibia. Shipwreck-hopping in 2018: who’s in? We arrived in Swakopmund, and I wondered if we had accidentally managed to drive all the way to Europe. Lying between the cold winds of the Atlantic Ocean and the searing heat of one of the oldest deserts in the world, I’d expected Swakopmund to be this wild, beaten-down desert outpost in amongst rolling sand dunes, but it felt more like I was walking around a pretty seaside town in Germany. The town was founded by the Germans back in 1892, and the architecture reflects this history to this day. Even the street names are still in German. It’s a strange place, dissimilar to anywhere else we visited in Namibia, and I could immediately tell why it was so popular with tourists. Walking around town, you’re met by comforts galore, from freshly-baked bread to vanilla milkshakes to decent Indian food to some of the best oysters in the world. Thanks to the German influence, you can find decent beer and wursts on every street. And when you’re not lazing around on the beach or eating a meal that doesn’t consist of game meat for the first time in a week, you’ll be outside hitting the dunes. Adventure sports reign supreme here, from skydiving to duneboarding; ATV racing to kite surfing; paragliding to dolphin-spotting. If there’s a way for tour companies to make money from these wild surroundings, you can bet they’re already offering it to tourists. I can imagine peeing myself with excitement over this town had I been on a multi-month overland trip across Africa, where joys like these had been rare. But as it was, I’d left Europe less than a week ago, so I wasn’t quite as enamoured with the prospect of a decent curry as everyone else was. So, if it wasn’t the comforts and it wasn’t the adventure sports that brought me here, why on earth was I in this part of Namibia? Cape Cross, just outside of Swakopmund, is home to the largest seal colony in Namibia and — depending on which source you believe — Southern Africa/the Southern Hemisphere/the world. Seal numbers total as much as 200,000 at certain times of year, and there are plenty of ways to get up close and personal with them. After receiving a gushing recommendation from our lodge owner in Ovita at the start of our road trip, Dave had already decided he was going to head out onto the water on a catamaran for a closer look. I promptly agreed to join him. How many times have I sworn I’ll never get on another boat? But oh look! Here we are again! Once more, I signed up for a boat trip while shovelling a handful of motion sickness pills into my mouth. As you can see, the waters were perilous. The coastline of Southern Africa is the only place in the world where you’ll encounter cape fur seals, and at Cape Cross, you’ll find the largest breeding colony of them on the planet. Are seals really that exciting, though? I was about to find out. On our first full day in Swakopmund, we drove to nearby Walvis Bay and made our way to the Laramon Tours office. They were one of the first companies in the area to offer seal-watching tours, and although their boats are some of the least fanciest on the water, they focus on small group tours, which sealed the deal for us. We’ll take small groups of tourists over luxury any day of the week. We paid 700 NAD (55 USD) each for our three hours on the water, which included lunch, some of the best oysters of my life, a glass of sherry, and unlimited rounds of champagne, beer, and soft drinks. Yeah, I’d say any tour that has me tipsy before lunchtime is totally worth doing. We had roughly a dozen people joining us on our catamaran, and once everyone had arrived on the dock, we were handed a glass of sherry (referred to as Namibian coffee by our captain), and allowed to clamber on board. After having spent two weeks chartering a yacht in Turkey, and a week in Greece, I immediately noticed how catamarans were nothing like yachts. They were so stable, I could barely even tell I was on the water. Even when the engine juddered to life and we began our journey to the cape, I felt so far away from motion sickness that I managed to take my eyes away from the horizon. Ahead of us were several enormous oil rigs, standing silent and tall, acting only to spoil our view. The price of oil had dropped so much recently, the captain told us, that the rigs are locked up and abandoned for now. Once the price increases, workers will head back out onto the water and begin drilling once more. At certain times of year, humpback whales and bottlenose dolphins make a regular appearance in the bay, often heading over to the catamarans to show off and say hello. March was out of season, unfortunately, but I barely noticed the lack of sealife, because, well, there were thousands of seals flinging themselves out of the water around us. Oh no, wait! That was actually the seals. Have you ever heard the sound a seal makes? I hadn’t until that moment, and oh my god, they sound just like angry men shouting at each other. This is the best example I could find online. What the hell, right?! Now imagine 100,000 seals all making that noise at once. Our peaceful cruise was interrupted by these weirdass sounds, but the seals were so adorable that I was smiling from ear to ear. There were thousands of them on the cape — some basking in the sun, some twisting and turning in the water, and some standing tall and bellowing into the air. We spent half an hour moored up beside them, snapping photos, sipping on champagne and eating freshly-shucked oysters, and giggling as we watched the seals turn themselves inside out while they played in the water. One of my favourite moments was just after we began motoring back to Walvis Bay. A seal decided to jump on board our boat in hope of a fishy treat, but after discovering we didn’t have any on board, hung out for a free ride around the bay anyway. I love this photo of Dave having a stare-down with the seal. “Mola Mola!” the captain cried out, and immediately cut the motor. “What’s a mola mola?” I whispered to Dave. “Sunfish!” he announced with a grin, and I couldn’t help but beam back at him. 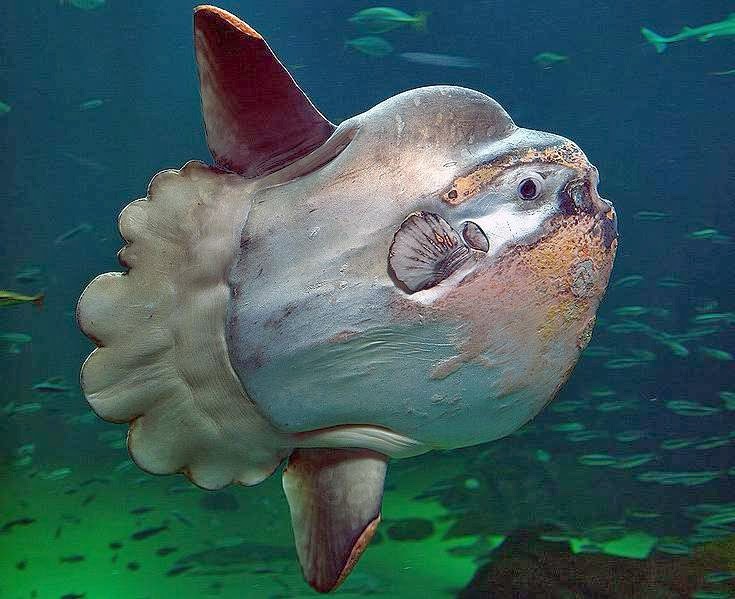 Sunfish are basically the weirdest animal on the planet. They’re enormous! They’re circular in shape, and can reach a whopping four metres in diameter and 2,300 kilograms in weight. Despite their size, their brain is literally the size of a peanut, and they pretty much just drift through the water, spending all day basking in the sun and eating jellyfish and sponges. They also lay 300,000,000 eggs at a time, and look really, really weird. Ever since Dave first mentioned them to me a few years ago, I’ve been obsessed with how strange they are. Being a non-diver that hates snorkelling and avoids the ocean, I didn’t think I’d ever get the opportunity to see one in person, so I was overjoyed when this guy decided to make an appearance. It may have even topped being surrounded by hundreds of thousands of seals. It was the perfect end to a perfect morning, and I raised my arms in the air and high-fived myself for having evaded nausea while out on the bay. Our tour had been just what we had been looking for in our time in Swakopmund. After so many long and tiring days on the gravel, spending three hours out on the water was the perfect way to unwind and enjoy our surroundings. Seeing so many tens of thousands of seals in their natural habitat was a special experience that I doubt you could find in many places around the world. When you threw in the best oysters ever plus unlimited champagne plus the perfect sunny day, I couldn’t have asked for anything more. It was a chilled-out morning and ended up being one of the highlights of Namibia. Not wanting anything to go wrong, we asked our captain for a food recommendation, and he sent us straight to Anchors on the waterfront. When someone tells you a restaurant make the best calamari in the world, you’re welcome to be skeptical, but oh my god, they definitely make the best calamari in the world. I highly recommend eating there. Swakopmund: was it worth it? I’ll confess that it was probably my least favourite stop in Namibia, because it had the least to offer me. Adventure sports are not my thing, and exciting Western comforts aren’t all that exciting when I haven’t been starved of them for months beforehand. But my tour of Walvis Bay was easily one of my highlights in Namibia. Swakopmund served a valuable purpose. It was the mid-way point on our road trip, which made it the perfect place to take a break. Exploring Namibia involves long driving days and little rest, so to have three days in the town and to do little aside from the catamaran cruise was bliss. We caught up on emails, we did our laundry, and gave Dave a rest from gripping the steering wheel and trying to keep us alive. Next stop: sand dune climbing in Sossusvlei! Sounds like a cool way to explore Namibia. How many boats were out there at any one time? Was it a popular activity? There were maybe around six-ish companies that offered the same tour, but there was only one other boat out on the water at the same time as us, and it didn’t follow the same route as us. It definitely wasn’t crowded with tours. Heading to Swakopmund in a few days and stumbled upon this post. So excited to visit now! We’ve been driving a truck across Africa for four weeks now and some home comforts sound more than a little amazing. The sounds that seals make are absolutely gut-wrenching hilarious. I think that tour be also be a highlight for me! I couldn’t believe how weird they sounded! And that I’d never come across those noises before. I really thought it was a bunch of men yelling at each other! If I had just seen these pictures and the place names, I never would have guessed this was all in Africa. It’s wonderful to see another side to the continent that’s rarely portrayed in the media. Right? I really felt like I was hanging out in Germany while I was in Swakopmund. Another wonderful adventure of yours! How much more do you have to write about Namibia? I love how the seals sound just like humans screaming! Hilarious! Maybe three or four more posts about Namibia! Lovely! the part of Africa which I had no clue about. The blue water looks amazing the dolphins look beautiful. And people say travel bloggers don’t read the articles they comment on ;-) Yeah, the “dolphins” were fantastic. Ha! I’m not so sure about that. I’m definitely up for some Shipwreck-hopping :-) I saw a shipwreck in Cyprus & Klein Curacao once and I absolutely loved it. If only it would be easy to enter, imagine the gorgeous photos you could take inside! Agree! There are/were a few in Namibia that people would climb over, although you technically weren’t allowed to do so. I’d love to see what they’re like inside. I’m obsessed with the oysters in Namibia! Visited in 2012 and haven’t been able to find better anywhere else in the world. I loved the fried ones with melted cheese on top! Yes! I loved the dozens of different oyster options you got along the coast. I may have had one meal where I ordered 21 oysters, all with different toppings on! How have I never heard of the Skeleton Coast before? It sounds like the perfect photo destination. I always love your super colorful photos. Do you use anything special to edit or just in camera? How amazing! Would love to visit this place someday, thanks for the share. Keep up the posts! Hope you make it there, Sheila! Kaikoura is on my list of places to visit early next year! It’s one of the few places I haven’t seen yet in New Zealand! Sounds like it could have been paradise if you had been traveling for a while. I looked up the town after reading this and love how the architecture looks so German. It really doesn’t look like how I would have imagined Africa to. Right? It really felt like we’d rocked up in Europe for a few days when we arrived! Hahaha love your comment about the person who wrote about dolphins! Right?! They sound so strange! Ha Ha. Everything was so quiet as I was reading down this post. I was kinda serious. But the seal screaming video made me LMAO. Lol. Thanks, Lauren. Hi! My kiwi (!!) husband and I are currently tooling around Namibia in our small Ford Fiesta. It’s been a bit of a stress-fest driving around in a 2×4 on roads that are NOT comfortable, but we’ve been making it work. I wanted to ask about you guys driving on C34 (skeleton coast road) was it ok to drive on in your 2×4? Your post didn’t really give it a glowing review; is it even worth going? Thanks! Ah, sorry, I think I’m too late getting back to you with this! But in case anyone else is reading and wants to know, it wasn’t really worth it for us, but that was partially because there was only one shipwreck on the part that we drove so it wasn’t super exciting. If you’re going further north, I imagine it’d definitely be worth it. I’ve just seen this, I’m heading to Africa for the first time next week for South Africa and Namibia, super excited. We are doing a bit of a whistle Stop tour given work holiday restrictions so have Etosha, Swapkopmund and Sossouvlei all in a week, so planning a lot of driving (4×4 thankfully). Any tips for the drives and sights along the way? Hi Lauren, we are going to Walvis Bay but I’m not sure if they will be there in August. I thought we’d be able see the seals from the shore. Could you give me the name of the company you went with? Thanks for the heads up; I better pack my sea sickness tablets! The seal in the boat picture is priceless.